Personnel Support Services and language training with our expanding teaming partners - S&K Technologies, Inc.
S&K Aerospace, Middle East Branch continues to provide Personnel Support Services (PSS) to multiple clients in Saudi Arabia. The two most recent strategic relationships created are with BlueForce, Inc. and JMark Services, Inc. In support of these efforts, S&K Aerospace has expanded operations by opening a branch office in the Eastern Province of Saudi Arabia. BlueForce is a management, technical, and professional services company headquartered in Hampton, Virginia. They’ve joined with S&K Aerospace, General Dynamics Information Technology, Chenega Corporation, and Multilingual Solutions to provide English Language Training to the Royal Saudi Air Force (RSAF) in Dhahran, Saudi Arabia. The RSAF English Language Training program gives the RSAF a training pipeline to develop their required number of students with a specified English Comprehension Level qualification. S&K Aerospace also provides all the Personnel Support Services (PSS) for the instructors and support personnel In-Kingdom, including sponsorship and immigration, housing, transportation, medical insurance, payroll services, and cultural training. The foreign nationals are treated to seamless integration into life and work in Saudi Arabia. Recently, S&K Aerospace hosted “a day in the desert” for members of the BlueForce team to help acclimate them to life in Saudi Arabia. JMark Services Inc. is a successful, woman-owned small business based in Colorado Springs, Colorado, that supports the RSAF with the design and delivery of intelligence training courses, including the deployment of instructors to Saudi Arabia to conduct capstone practical exercises. S&K Aerospace has been providing PSS for JMark. 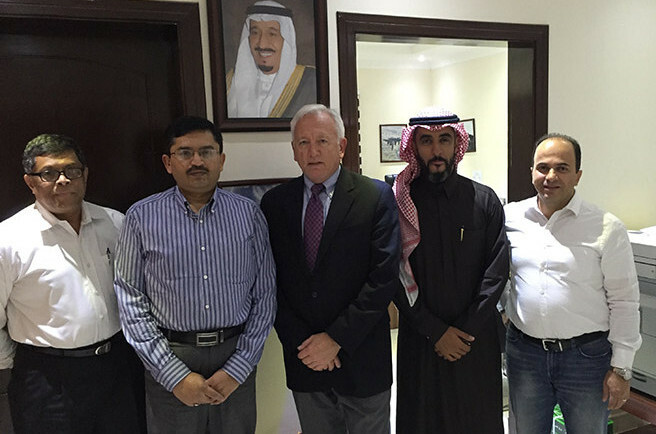 The photo above shows S&K Aerospace employees at our Riyadh office: (L to R): Abdualaziz Katyasam, Haroon Siraj, Les Lunceford (BlueForce PM), Abdullah Al-Rasheed, and Mohammed Samarah. Employees that were not available for the picture are: Jarrah Al-Shammri, Falah Al-Shammri, Mohammed Haneesh, Ali Al-Qahtahni, and Mohammed Al-Shehry. More from S&K Technologies Inc.